Secure use with user authentication by: Login, Login/ Password, PIN code, RFID card. Modification of the job properties (forcing to B&W printing, duplex or change the number of copies). User-friendly selection of the documents to print. Payment and sending to Gespage server of prints, copies and scans performed. Scan to Me service by email or home directory. Management and accounting of the scans to email of the user and to a restricted address book. Management and configuration of the terminal from a user-friendly Web interface. The field “From:” of the emails is filled in automatically with the user’s name. 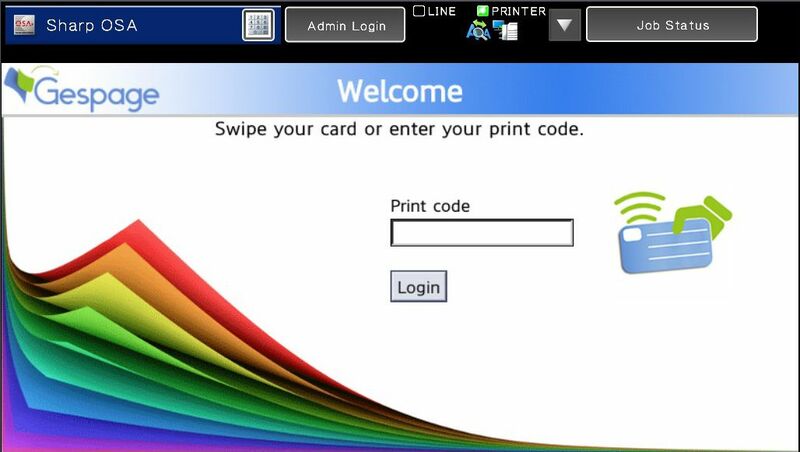 The eTerminal Gespage is compatible with all Sharp MFPs fitted with a touch screen, from the OSA versions 3.5. The MFP must get the AMX3 license. The eTerminal Sharp does not support 480×272 screens on the non- touch MFPs. Sie möchten Gespage-Händler werden. Zögern Sie nicht uns eine Nachricht zu schreiben. Sie suchen einen Gespage Händler? Gerne nennen wir ihnen einen Partner in ihrer Nähe. Hier erhalten Sie eine Gespage Testversion ohne Funktionseinschränkungen.